Jacob Kassay is an innovative young artist. 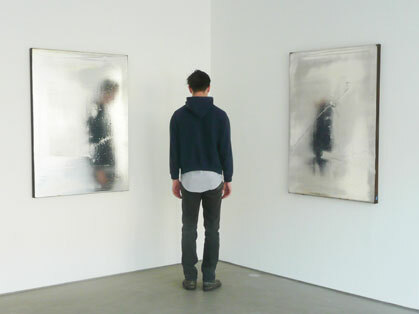 Kassay’s first solo show on view at Eleven Rivington, his paintings are paint on canvas that are plated in silver. The technique of the underpainting creates an textured dynamic surface. The painterly graphic quality of the brushstroks are seen quite deliberatly. Tragically the paintings do not photograph well, and unlike this image, these paintings do NOT look like mirrors. I was most attracted by the quality and subtly the dipping technique would slightly burn the edges of the canvas. One piece on the floor not a sculpture but rather three paintings sitting ontop each other with a rock of asphalt between them. A dialogue around the silver asphalt chemical compositions of the piece and the relationship to sculpture and metal. Your precisely correct with this blog post.